Back in 1998 the Colorado State Patrol began a campaign to target aggressive drivers. Rather than calling 911, drivers, bicyclists and pedestrians can dial *CSP to report an aggressive driver. Remember to provide the dispatcher the exact location (road and direction), a description of the vehicle, and the manner in which the vehicle is being driven. Do not attempt to follow or pursue the vehicle. It is not your job, it’s not safe and it is rarely going to turn out well. If you’ve ever complained that Colorado drivers are terrible, there are statistics to support your claim. In a study by Allstate, Denver drivers fared worse than the national average. Denver drivers had an average of 8.2 years between claims, compared to the national average of 10. Drivers here also “hard brake” 20 times for every 1,000 miles, compared to the national average of 19. If you want to improve our state’s reputation you can remember to give the courtesy wave. When a driver lets you in, put your hand up near your rearview mirror or out of your window and maybe even throw in a wave. 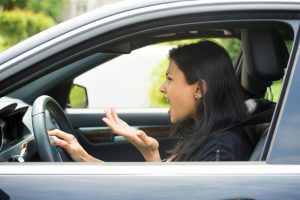 You may want to swerve, swear, scream but doing so will usually only stress you out, cause an actual accident, or provoke the aggressive driver to slam on their brakes. Just like commenting on Facebook post that you don’t agree with, the chances of changing the bad behavior is next to nil. You may laugh at the advice of taking a few deep breaths but you won’t regret it. It’s called predictive driving – when you see someone swerving around cars, or if you just got cut off by a guy on his cell phone who is thinking about anything BUT driving, just give them room. Let them get into their own accident down the road, away from you. One of the most annoying things that can happen on the highway is to get stuck behind a left lane hog. But if you try to go right to get around them, they inevitably will choose that moment as the time to move over to the right lane and possibly right into you. Consider yourself lucky if a slow left lane driver is the WORST thing you have to deal with today. Should we honk at drivers who use the shoulder, and in other ways annoy us? Absolutely not! The car’s horn is for warning other drivers and pedestrians, not for venting our frustration or annoyance. Think about it like this. A horn is one way to say “Head’s up! You’re about to hit me.” as you’re backing out of that parking spot at King Soopers. It’s a lot easier to hit the gym or run when you get home and shake off the stress of bad drivers. If you don’t work out after stressful situations, you might turn to unhealthy expensive habits like drinking and overeating. Is this something for people who have reached a certain age? Who cares? Take the scenic route. Take Alameda rather than 6th Ave. Trust us, it’s a lot less stress. Take the smaller service roads, so you don’t have to deal with tired, distracted drivers at 80 miles an hour. Why flip people off? Give them a thumbs up or a courtesy wave instead. A huge smile perplexes and disturbs the small brain of the average terrible driver more than a middle finger ever could. Plus, maybe your good mood will rub off on them. This one goes together with ‘leave them space.’ The trick to driving safely on the highway is to assume that everyone else on the road is a complete moron, and out to get you. You’ll never be surprised when you get cut off, and you’ll be prepared for it, too.